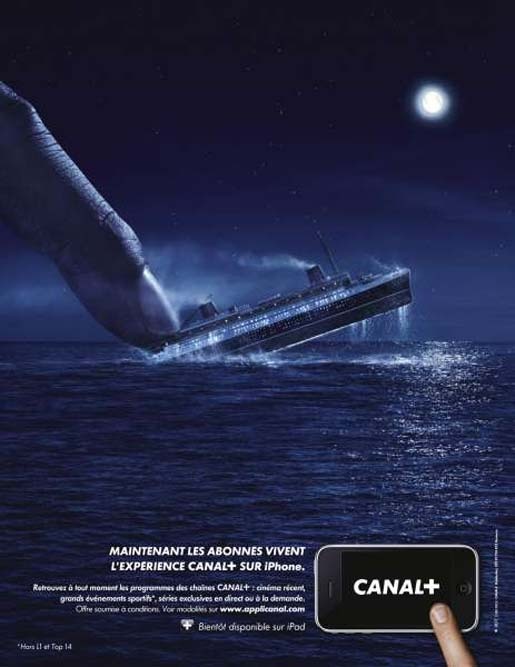 Canal+, the French television channel, is promoting its iPhone app option with “La Bascule” (The Flip), a television commercial directed by The Glue Society. The commercial proposes a tilted plot twist for a 1960s movie viewed on an iPhone. The campaign includes print advertisements with the same concept, a finger changes the plot at the movies and in the football. The Bascule campaign was developed at BETC Paris, by creative director Stéphane Xiberras, art director Raphaël Halin, copywriter Benjamin Sanial, agency producer Fabrice Brovelli, sound designer Christophe Caurret, interactive producer Ivan Beczkowski, account team Raphaël de Andreis, Christophe Neyret, François Brogi, Alice Cheron. Filming was shot by The Glue Society director Gary Freedman via Park Pictures executive producer Jackie Kelman Bisbee, head of production Dina Rodriguez, executive producer Justin Pollock, producer Erin Wile and via Moonwalk Films with director of photography Fred Elms, producer Gaspard Chevance and line producer Julien Sanson. Post production was done at Nightshift, Paris by producer Nolwenn Hajo, and Rock Paper Scissors by editor Carlos Arias. Music is “Rhapsodie roumaine en la majeur op. 11 n° 1, Ciocirlia / l’Allodola” by George Enescu.